Alabama has a great and wonderful legacy of linebackers and Eddie Robinson, well he went to Alabama State so he played under the shadow of this colossus. Undeterred, Robinson would excel playing for the Hornets and parlay his tremendous career there into a second round choice by the Oilers. 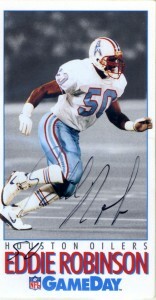 The Oilers were looking for new blood at linebacker and Robinson was a competent and versatile fit for the team. The 1992 draft was not a strong draft by any regards outside of the first round, but the team made the most of their selections- especially with Eddie, who was a shrewd selection by the team. Although never making the ProBowl during his tenure, Robinson was consistent and his longevity would allow him also to endure for 11 seasons at linebacker. He was also adequate in coverage, replacing the venerable Johnny Meads at linebacker. Robinson would sign with the Jaguars in 1996. He’d start on defense for the Jaguars when they’d make their first two playoff runs in the then AFC Central. 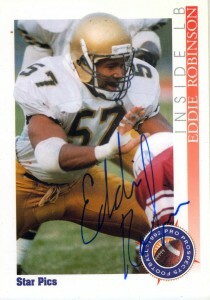 Eddie would soon thereafter resign with the Oilers- who were then the Tennessee Oilers under defensive coordinator and now head coach Jeff Fisher. He’d play for the team as it changed its name to the Tennessee Titans and made a SuperBowl run in 1999 and through 2001. Robinson would play one final season for the Bills in 2002 and retire. The GameDay card here is a really superior card as it really frames his figure well in the long portrait style. Its a shame that the football card market imploded the way it did because the Action Packed and GameDay cards were really a unique foray into trading cards.